McFALL, John Joseph, a Representative from California; born in Buffalo, Erie County, N.Y., February 20, 1918; attended the public schools of Manteca, Calif.; graduated from Modesto Junior College, Modesto, Calif., 1936; graduated, University of California, Berkeley, Calif., 1938; J.D., University of California Law School, Berkeley, Calif., 1941; admitted to the bar in 1941; attorney in Oakland, Calif., in 1941 and 1942; served as staff sergeant in Security Intelligence Corps, 1942-1946; engaged in the practice of law in Manteca, Calif., in 1946; city councilman and mayor of Manteca, Calif., 1948-1951; member of California state assembly, 1951-1956; delegate to all State Democratic conventions, 1948-1958; elected as a Democrat to the Eighty-fifth and to the ten succeeding Congresses and served until his resignation (January 3, 1957-December 31, 1978); majority whip (Ninety-third and Ninety-fourth Congresses); reprimanded by the U.S. House of Representatives on October 13, 1978, for failure to report campaign contributions from a Korean lobbyist; unsuccessful candidate for reelection to the Ninety-sixth Congress in 1978; died on March 7, 2006, in Alexandria, Va.
Papers: 1957-1978, 605 linear feet. 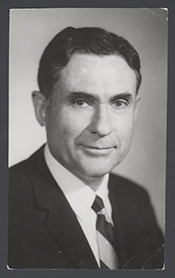 The papers of John Joseph McFall include correspondence, reports, case files, clippings, photographs, and other papers from his congressional service. A finding aid is available in the repository and online. Papers: In the Carl Bert Albert Congressional Papers, ca. 1910-1976, 1000 cubic feet. Correspondents include John Joseph McFall. Ralph Nader Congress Project. Citizens Look at Congress: John J. McFall, Democratic Representative from California. Washington, D. C.: Grossman Publishers, 1972.